A terror attack killed at least 12 people at the offices of French satirical newspaper Charlie Hebdo on Wednesday morning. Another 11 people were injured, four of them seriously. On Wednesday evening, NBC News reported that one suspect had been killed in a police raid and two others were arrested. t Jean Cabut, editorial director Stéphane Charbonnier, and two police officers. Cartoonists Georges Wolinski and Bernard Verlag were also discovered among the dead, and later psychiatrist Elsa Cayat was identified. The newspaper housed some of France’s most acclaimed cartoonists. French police said at least two armed gunmen walked into the offices of the satirical newspaper and opened fire with Kalashnikov AK-47s, shooting down journalists. They were apparently angry over the paper’s spoof pieces on the prophet Muhammad. 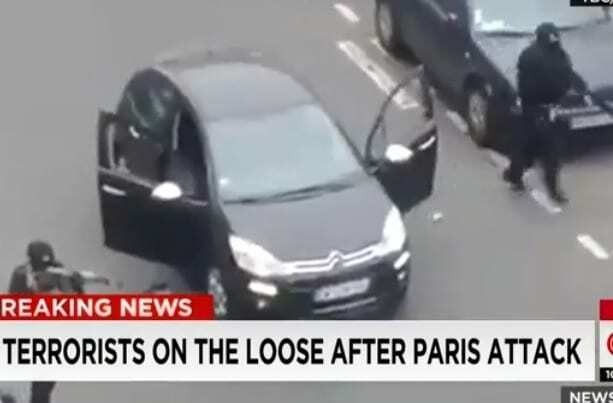 Shocking images also showed the hooded gunmen wielding their machine guns at a police car on the streets of Paris. Also Read: Sony Hack: What Are US Options If North Korea Is Confirmed as Cyberterrorist? TV news networks have pivoted to wall-to-wall coverage of the attack as at least two masked gunmen currently remain at large. The offices of the satirical newspaper — which produces cartoons, reports, polemics, and jokes — had previously had heavy police protection, but reports suggest that protection has dwindled in recent months. Buildings near the shooting in central Paris are currently on lockdown. TV news networks report the attacks were sophisticated and coordinated, carried out by professional gunmen. Reports are suggesting the two gunmen had help from a wider network of terrorists. U.S. Press Secretary Josh Earnest first appeared on MSNBC Wednesday morning, vowing the United Stated stands ready to help its allies in France after the attack. U.S. defense officials announced there is no decision to increase security at the U.S. Embassy in Paris. Charlie Hebdo writes often savagely critical satire about French politics, and does not spare Islam. 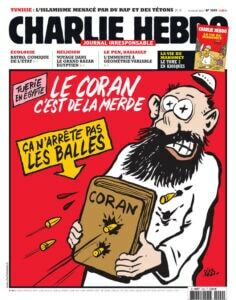 Last year, Islamic groups tried to sue the magazine for blasphemy over a cover (pictured above) with a cartoon of an imam, saying, “Islam is s—.” Its website was hacked in 2012 and its offices firebombed in 2011, both over shocking send-ups of Islam’s prophet, Muhammad. The newspaper’s most recent cover joked about author Michel Houellebecq’s new novel “Submission,” which speculates about a future in which France elects a Muslim president. The magazine also posted a cartoon of ISIS leader Abu Bakr al-Baghdadi to its Twitter feed earlier today. 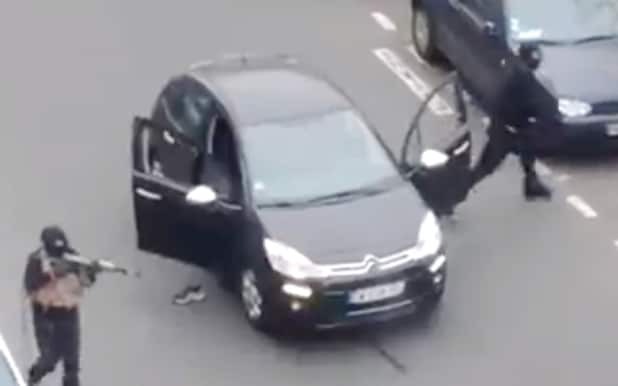 Security footage of the gunmen as they arrive at the Charlie Hedbo newspaper headquarters in a black car. The heavily armed gunmen open fire on the first police responders on the scene. Police and paramedics crowd the street the outside Charlie Hedbo office. A bullet hole in a window of the Charlie Hebdo office. French President Francois Hollande surveys the carnage in Paris. A damaged police car is hauled away after gunmen attacked the newspaper's office on Jan. 7, 2015. The defiant slogan in support of the paper lights up the side of a building during a rally. People line the streets for a rally in support of Charlie Hebdo, which was attacked by gunmen for printing cartoons making fun of the prophet Muhammad. People raise their pens in support of the newspaper Charlie Hebdo following the attack which killed 12 people. Special Forces soldiers and police gather after storming a building where suspects linked to the Charlie Hebdo massacre in Dammartin en Goele, France. Police gather around compact European vehicles in France. Special Forces and police gather after storming a building where suspects linked to the Charlie Hebdo massacre in Dammartin en Goele, France.